My family was introduced to Yuval Noah Harari courtesy of a random podcast on a long drive one day -- I think it might have been from the ABC's Big Ideas series, which would be appropriate, because Sapiens is a big book packed with Big Ideas. From Preston to Korumburra, all of us were spellbound by Harari's sparkling, provocative conversation. He speculated that if you abandoned one chimpanzee and one human on a desert island, the chimp would probably survive and the human probably wouldn't make it. But if you abandoned a hundred chimps and a hundred humans, the humans would win the survival game hands down. This is because humans can cooperate, and organise. He talked about the great con job of the agricultural revolution, which is supposedly a great leap of progress, but actually enslaved millions to back-breaking labour and a narrowing of nutritional choices. He talked about the power of imagination, unique as far as we know to us humans, which has led to our world being organised around invisible, intangible notions like religion, and money, and nationalism: things that exist only inside our own heads. He painted a picture of a possible future where the divide between the elites and the downtrodden is marked by the availability of cyber-enhancements to our bodies and brains. And when we reach that stage, would we still be human beings, or some other kind of creature entirely? It's taken me a long time to finish this book (on the Kindle), despite its exciting breadth and sweep, and the bold, stimulating ideas Harari presents. It reminded me of Jared Diamond's ground-breaking Guns, Germs and Steel, which made me see history in a completely different light, and indeed Harari cites Diamond as an influence in his acknowledgments. I felt the book began strongly, but ran out of puff in the final third or so. Still, a worthwhile, challenging read. Four weeks ago, my father had a massive stroke. For a few days, we thought we were going to lose him; thankfully, he is still with us, but he has lost much of his movement, most of his speech, and perhaps part of his memory. It's impossible for my mother to care for him at home, so this vigorous, independent, self-contained man has had to submit to his worst nightmare: a nursing home. I've long admired Karen Hitchcock's columns in The Monthly; this longer piece is similarly compassionate, thoughtful, complex and confronting. Now my beloved father has joined their ranks, I share her fury at the ease with which the elderly in our society can be written off as 'not worth treating.' Dad received the best of care in hospital (and hopefully will continue to receive it in his new home), from gentle nurses and thoughtful orderlies (thank you, Theo, for taking Dad out into the courtyard to feel some fresh air on his face, and for turning on his radio so he could escape into music). But there were also the doctors who spoke over his bed as if he couldn't hear or understand, who treated him as a collection of symptoms, a failed procedure, rather than a person. 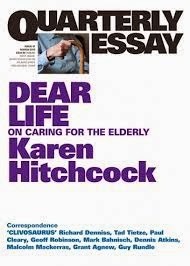 I urge everyone in the health profession to read this essay, and also everyone who has an elderly relative, or who hopes to live to be old themselves one day. This was such a terrific read. 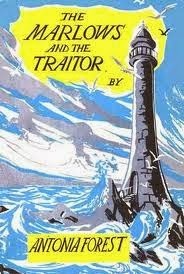 On one level, it is a fairly standard kids' adventure story, complete with seaside holiday, exploration of deserted house, discovery of spy, kidnap, shipwreck, and imprisonment in lighthouse. But nothing is straightforward in Antonia Forest's books; as someone put it on the Trennels forum, 'No motive is unmixed.' The villain is a charismatic, appealing character (though clearly behaving badly). The young protagonists are by turns courageous, terrified, sympathetic, resourceful, reckless, panicky… but their reactions are rarely predictable, and never stereotyped. It was eminently satisfying, too, to fit in this missing piece of the puzzle, and reflect on the lasting effects that this adventure has on the four youngest Marlows, and how they echo through later volumes -- Ginty's paralysing self-doubt, Peter's occasional bullying and fascination with treachery, Nicola's growing maturity, Lawrie's self-serving fantasy world. Not many children's books of this era would have dared to allow one of their young heroes to actually shoot (and presumably kill) an adult enemy. It's just one of the risks that Forest takes in this book. I can't wait to re-read it. Hesba Brinsmead was a prolific Australian writer for young people, who has been criminally neglected in accounts of Australian YA. Born and educated in the remote Blue Mountains bush, until she was sent to school in her teens, she lived all over the country, working as a teacher. This is reflected in the breadth of her writing; her many diverse novels are set in urban Melbourne, the north coast of New South Wales, the Tasmanian bush. She was ahead of her time in many ways, writing about race relations and the environment long before such issues were fashionable. One of my book groups set themselves a project to read a range of her books, and we were so impressed that we've all swapped around our titles so we could read some more. I had already read (and adored) Pastures of the Blue Crane, her best known book, for which she won the CBC Book of the Year, and a couple of other novels, so I chose A Sapphire for September. Set partly in Sydney and partly in the rural hinterland where the characters seek for gemstones, it follows 16 year old Binny and her young friends as they foil the plans of a developer to despoil a beautiful valley, by staking out mining claims all over the land. It took me three weeks to finish this book. No fault of the writing, or the plot, which I can now barely recall; but sometimes a book is just a prop in your hand as you sit in a hospital waiting room, something to stare at while your eyes and mind glaze over with anxiety. My family underwent a medical crisis while I was reading A Sapphire for September. It's no reflection on the book when I say that I will never want to pick it up again.